Happy solstice, everyone. To mark the occasion I figured I’d say a bit about archaeoastronomy, which is an important topic at Chaco that I don’t discuss very often. The various alignments identified at the great houses in the canyon have become quite famous through the work of the Solstice Project to document them, and while I don’t think all of their proposed alignments are necessarily real, there is enough evidence by now to suggest that at least some of them are. Cardinal direction alignments are the most obvious, and the least likely to be coincidental (in my view), and these are found at a few of the sites at Chaco, particularly Pueblo Bonito, Pueblo Alto, and Tsin Kletzin. Interestingly, these three are all in the center of the canyon (“Downtown Chaco”), and the line running due north-south from Pueblo Alto to Tsin Kletzin runs between Pueblo Bonito and Chetro Ketl through the “Chaco Amphitheater.” This all suggests some pretty extensive planning, but it’s interesting that the other parts of the canyon don’t seem to have been part of it. I find the Solstice Project’s proposed alignments at many of the other sites in the canyon a lot more dubious, especially since so many of them are allegedly to the minor lunar standstill. It seems more plausible that there would be solstice alignments in the canyon, and there do indeed seem to be some “viewing points” from which solstice sunrises are marked by prominent features on the horizon, but the only solstice-aligned building proposed by the Solstice Project is Aztec West, which isn’t even at Chaco, although it’s clearly Chacoan in style. 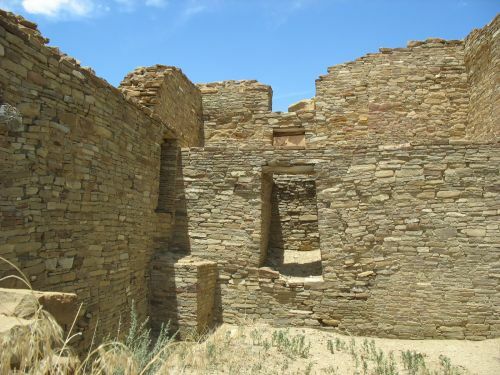 Steve Lekson has proposed that one possible reason for the variety of alignments in Chacoan great houses is conflict between factions within Chacoan society. The way he sees it, solstice alignments were the regional tradition, and cardinal alignments were a new idea at Chaco, perhaps threatening to the old order in the way that many new developments at Chaco were. Indeed, alignment to the southeast was a common architectural practice in pre-Chaco communities, and this may well have had something to do with the solstices, although as far as I know none of these buildings have been demonstrated to have precise solstitial alignments. I’m not so sure that cardinal direction alignments were not present in the region before Chaco, however, and I’m also unsure of whether differences in building orientation really represent ideology the way Lekson proposes. I’m more inclined to wonder if they may instead reflect different ethnic or regional origins for different groups. In either case, though, the factionalism idea is interesting, and quite compatible with what we know of later Pueblo societies. In Lekson’s version, the solstice alignment of Aztec reflects the founding of that center by the solstitial faction at Chaco, while the cardinal faction went elsewhere, maybe to Paquimé, which has a strong cardinal alignment. I’m not sure how much of that I buy, but it’s worth thinking about. 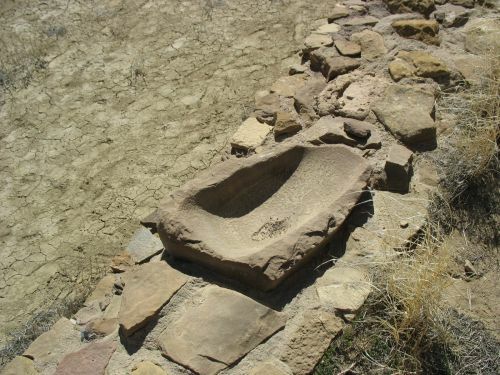 Pottery is the most important type of artifact for archaeology in the Southwest. This is because the agricultural societies of the prehistoric Southwest made huge numbers of pots and often decorated them in distinctive ways that differed both from place to place and over time, often within quite short periods. 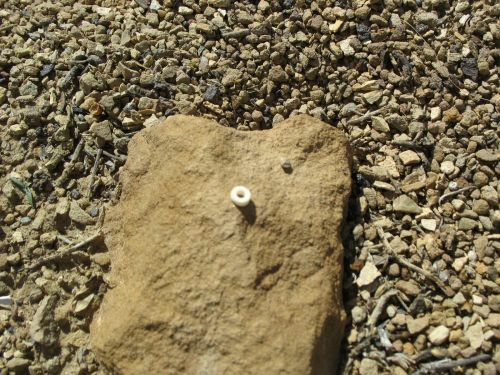 With the precision available from tree-ring dating, certain pottery types can be dated to remarkably short periods, in some cases consisting of less than 100 years, and those types in turn can be used to date unexcavated sites with no tree-ring dates of their own. Differences in decoration over time are more obvious than differences among places for most periods, which is an interesting fact that probably deserves more attention than it has gotten. Ceramic design styles changed at roughly the same times over amazingly large areas that in some cases don’t show any other evidence of substantial contact. 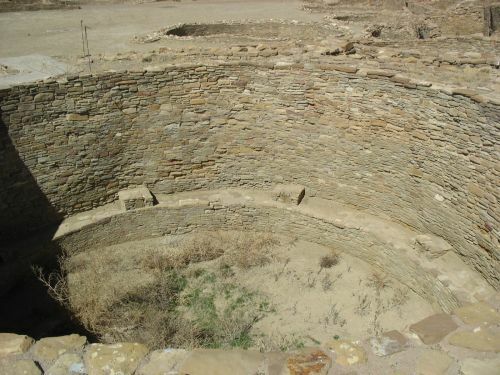 During the Chaco era, from about AD 1030 to 1130, the dominant design style throughout the northern Southwest used a lot of hachure, for example. The specific types have different names, assigned to them by archaeologists working in different regions, and despite the general similarity in design these can be distinguished by distinctive aspects of their manufacture. These include the type of clay used for the vessel (known as the “paste”), the presence and nature of an additional type of clay (the “slip”) put on top of the paste especially for painted types, the type of paint used, and the material used to temper the clay. Tempering is the addition of some material to the paste to make it easier to work. Almost all Southwestern pottery types are tempered, and the type of tempering material is one major way different regional wares are distinguished. To make this more concrete, let’s look at the Cibola pottery tradition, to which Chaco’s pottery belongs. There are two “wares” within this tradition: Cibola white ware and Cibola gray ware. The gray ware is the “utility ware” used for cooking pots and other mundane vessels. It is never painted, and when it has any type of decoration this typically consists of some sort of corrugation. Types of corrugation vary over time. During the height of the Chaco era, the dominant type was corrugation all over the vessel, whereas in earlier times only the neck would be corrugated. 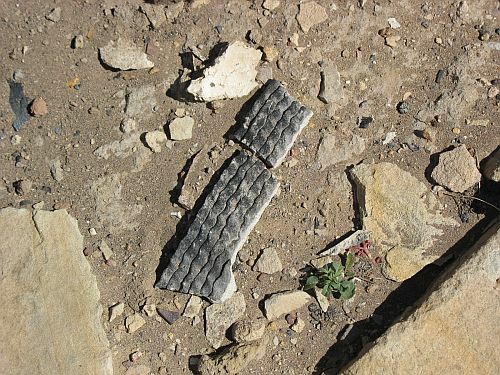 Corrugated sherds are very common at Chacoan sites, because these vessels were made in large numbers, broke frequently from heavy use, and were mostly large jars that broke into many pieces. Vessels forms are almost entirely jars rather than bowls. 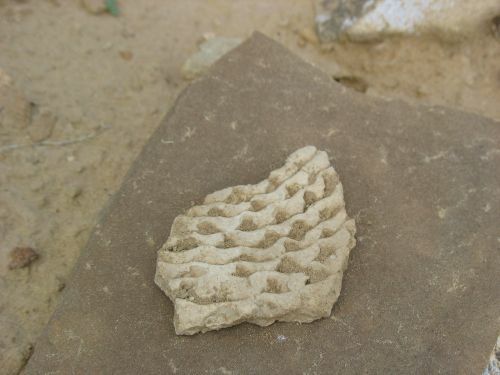 Temper is typically either sand (in some cases probably from ground-up sandstone) or ground-up sherds. Cibola white ware is more complicated. This is the main “decorated” ware made at Chaco and in the area to the south of it. These vessels have the same sand- or sherd-tempered gray paste as the gray wares, but the decorated surface also has a white slip that gives vessel a white appearance from the exterior. The slips are thin and often applied in a sort of “washy” manner, and in some cases the gray paste can be seen beneath them. Designs are painted on with mineral-based paint (usually made with iron oxide), at least until about AD 1100. Forms are both jars and bowls. Jars are decorated on the exterior, while bowls are usually decorated on the interior. Similar gray and white wares are present for most other regions during the same period. San Juan gray and white wares were made north of the San Juan River and are distinguished primarily by the use of crushed volcanic rock rather than sand or sherds as temper. The white slips on the white ware are also thicker and often highly polished. 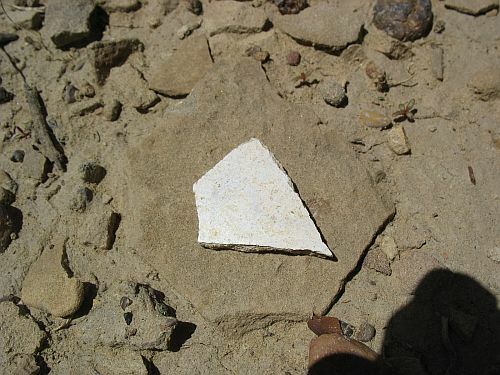 To the west, in the Kayenta area, white wares were generally painted with organic (carbon-based) paints, and over time this practice spread eastward, until after 1100 it was common in the Cibola and San Juan areas as well. 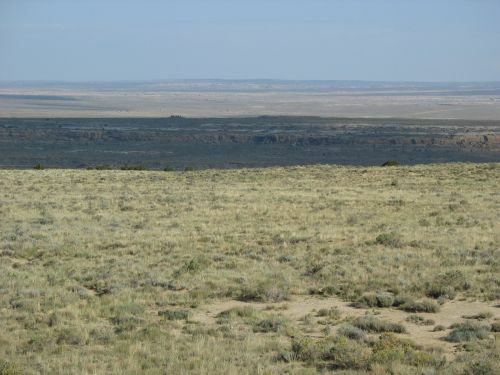 A particularly important ceramic area for understanding the Chaco system is the Chuska Mountain area to the west, along the Arizona-New Mexico border. 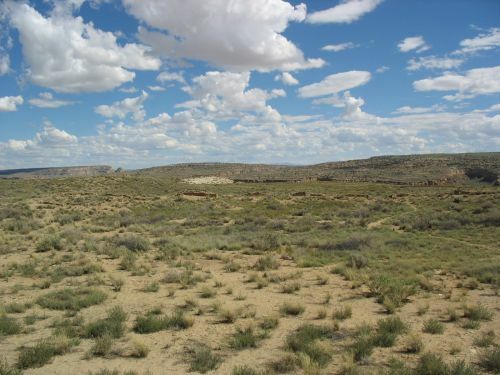 In regional ceramic terms this area basically separates the Cibola and Kayenta traditions, and in some ways it was transitional between the two. Chuskan potters adopted carbon paint earlier than those in the Cibola and San Juan areas, so imported white wares from the Chuskas to Chaco are typically carbon-painted although the designs on them are generally the same as local types. The thing that really distinguishes Chuska pottery, though, is temper. Chuskan ceramics are nearly universally tempered with trachyte, a rare and very obvious type of volcanic rock that outcrops only in a small area in the Chuskas. Trachyte-tempered pottery is therefore virtually guaranteed to have been imported from the Chuskas. Why is this? Because potters are generally thought to have used local materials for temper (and for clay, but pinpointing clay sources is much more difficult). Designs might be similar over a wide area, but if the temper in a vessel is a material only found in a very restricted area, it’s virtually certain that the vessel was made near there. 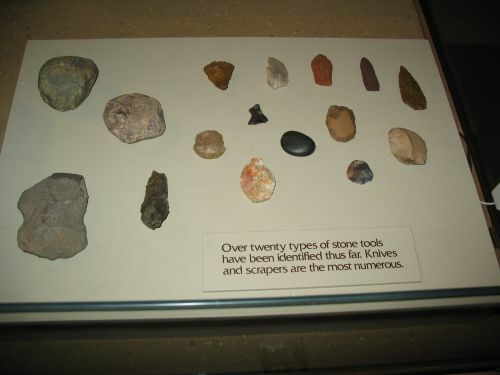 Unfortunately, most of the materials used for temper in the Southwest are very widespread; there’s sand everywhere, sherds would be present wherever anyone had broken pottery (so, again, everywhere), and the types of volcanic rock used in the San Juan region were quite widespread. Luckily, however, trachyte-tempered Chuska pottery is an exception to this, which makes it very easy to identify imports from the Chuska area at Chaco and elsewhere. There are other ways to determine the source areas for pottery. X-ray fluorescence (XRF) and instrumental neutron activation analysis (INAA) are two widely-used methods of determining clay sources by the concentrations of trace elements in sherds, but they are very expensive and the results can be difficult to interpret. 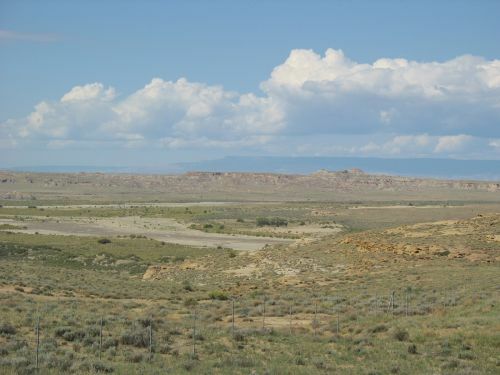 Some studies using these techniques have been done in the Southwest, and a database of element concentrations for different source areas is beginning to develop. 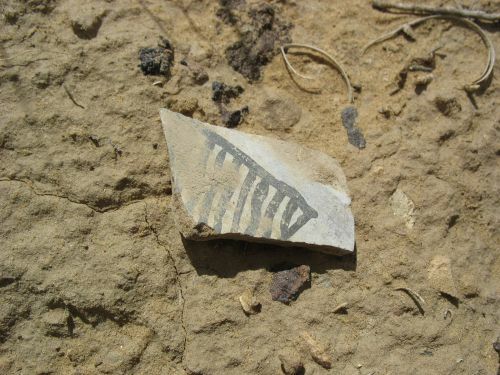 At Chaco, however, analysis of pottery sources has so far depended primarily on the more traditional techniques of looking at paint, slip, and especially temper. 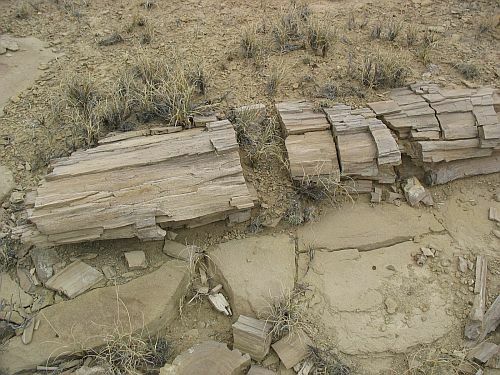 The biggest study was that done in connection with the Chaco Project, the results of which were presented in a 1997 publication by Wolky Toll and Peter McKenna (available on the Chaco Archive website). Some of the data from this study was also used by Toll in his 2001 article that I have discussed before. In brief, what Toll and McKenna found was that the Chacoans imported a lot of pottery. The amounts of imports and their sources varied over time, however. Imports were relatively rare before AD 800, making up 16.6% of the sample, but they came from a variety of sources, including the Chuskas, the San Juan region, and the Mogollon region to the south, which has very distinctive brownwares that are obvious imports when they appear. Trachyte temper is only present in 3.6% of the total sample. The period from 800 to 920 has a rather small sample from the Chaco Project excavations, but an increase in imported ceramics is apparent, with 28.1% imports and 9.7% trachyte-tempered. 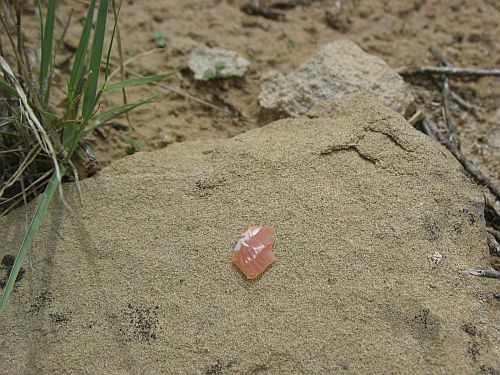 The most common non-local temper, however, was chalcedonic sandstone, thought to come from the area to the south of Chaco, which comprised 13.2% of the ceramics from this period. This is consistent with other evidence for intense contact with the area to the south at this time. From 920 to 1040, overall imports drop slightly to 25.1%. Chalcedonic sandstone drops to 7.9%, while trachyte rises to 12.3%, the highest percentage for any specific type of import. This trend continues in the following period, from 1040 to 1100, which corresponds to the height of the Chaco system and the construction of most of the great houses in the canyon. The overall percentage of imports rises to 39.8%, with almost all of that (30.7%) being trachyte-tempered. It’s well-known that many other goods were being imported from the Chuskas at this time, especially wood, so it’s not surprising that Chuskan pottery would also have been popular. 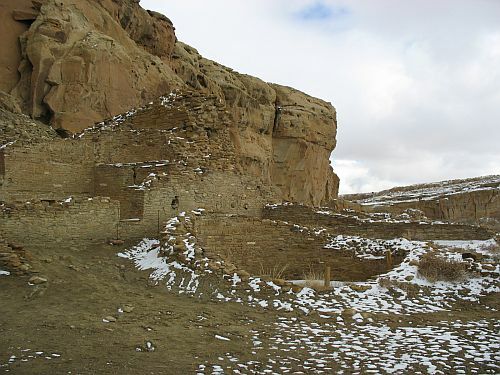 There were a lot of Chacoan great houses and communities in the Chuska area, which seems to have been closely integrated into the overall Chacoan system, perhaps to a greater degree than other “outlying” areas. The shift from south to west in the focus of the system seen in the pottery data is echoed in other types of evidence from this period. The trend toward higher imports reaches a peak in the 1100 to 1200 period, which includes the end of Chaco’s regional dominance (but perhaps also its peak). Imports constitute an astonishing 50.4% of all the ceramics from this period, and trachyte-tempered pots comprised 31.3%, a gain in overall percentage from the previous period but a loss relative to other imported types. 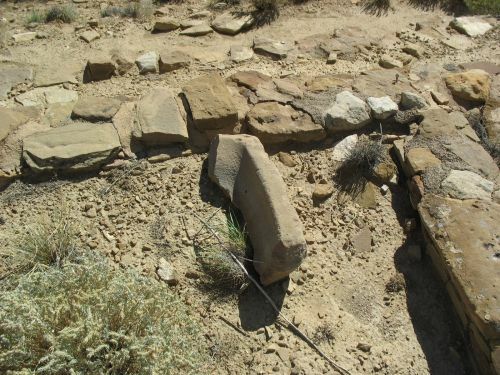 Chalcedonic sandstone continued to decline, while Kayenta wares increased to 4.8% after never having exceeded 1% before. It’s important to note, however, that the sample from this period is much smaller than that for the previous period and it may not be totally representative. The last period, from 1200 on, has a very small sample but continues to show a high percentage of overall imports (45.7%). Trachyte drops to 21.6%, and San Juan wares skyrocket to 16.4% after never having exceeded 5% before. This shift to the north for ceramic sources surely has to do with the relative decline of Chaco in this period and the rise of centers to the north, especially Aztec, which probably succeeded Chaco as the center of whatever Chaco had been the center of. 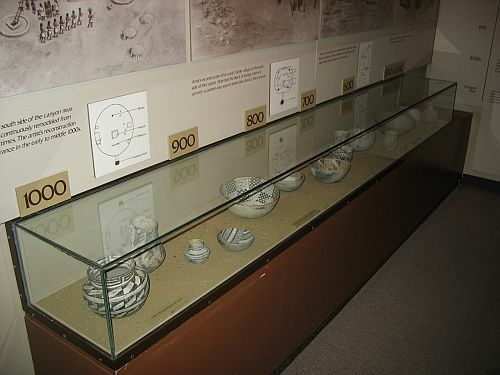 This is also the period during which Mesa Verde became a major population center, but despite the fact that the main decorated white ware type is known as “Mesa Verde Black-on-white” it’s unlikely that many of the San Juan wares found at Chaco came from Mesa Verde itself. 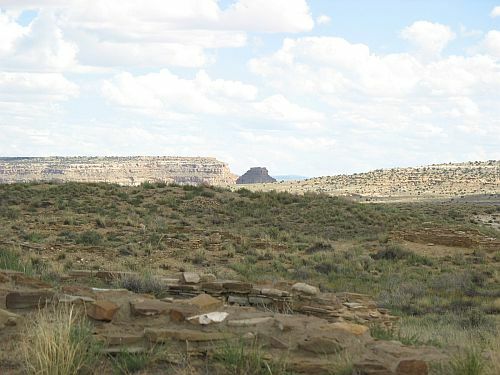 It’s much more likely that they came from Aztec or elsewhere in the Totah area, which had much closer ties to Chaco than Mesa Verde proper ever had. So basically, the pattern that emerges from the ceramic data is of a shift in imports from the south to the west as the Chaco system really got going, followed by a shift to the north as it faltered or changed. This is paralleled in other types of artifacts, as well as in settlement patterns. 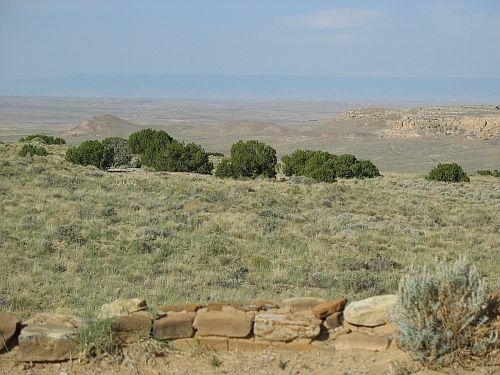 The outlying communities to the south in the Red Mesa Valley were being abandoned in the late eleventh century even as new outliers like Salmon were being built to the north. There are enough lines of evidence pointing in this direction to suggest that it corresponds to something real, but it’s hard to say what exactly was going on and why. It’s also important to note the weaknesses in this analysis. Remember, this is Chaco Project data. 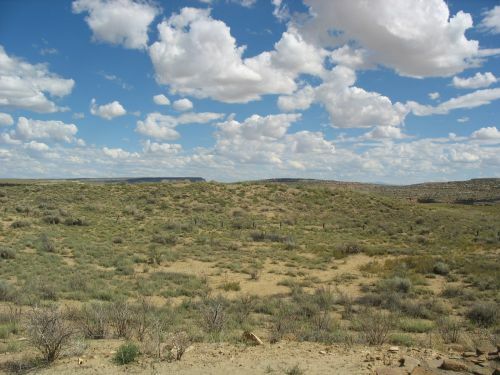 It doesn’t include any of the pottery excavated from Pueblo Bonito, Chetro Ketl, Pueblo del Arroyo, or any other sites excavated prior to the 1970s. It also has a heavy bias toward data from Pueblo Alto, which as I’ve mentioned before can be problematic in overall interpretations of Chaco. However, at least the heavy importation of Chuska wares does seem to be supported by data from Pueblo Bonito. 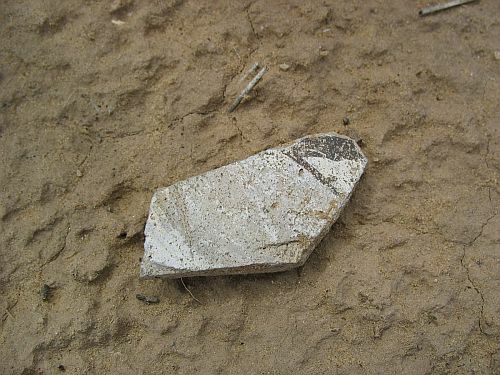 Anna Shepard, the ceramic analyst who pioneered many of the techniques that are now standard in the Southwest, analyzed the sherds from Neil Judd’s excavations at Bonito in the 1920s and concluded that many of them were imported from the Chuskas based on the presence of trachyte temper. Judd, who was heavily devoted to the currently prevailing notion that Pueblos were self-sufficient for utilitarian goods like pottery, was so skeptical of this finding that he actually wrote a rebuttal to Shepard’s analysis and published both in his report. As it turns out, however, Shepard was right, and ahead of her time, in seeing substantial importation of pottery to Chaco. So if not for lack of fuel, why all the imports? One clue may come from the types of vessels imported. The Chuska imports were primarily gray ware utility vessels, which were used for cooking. It has been proposed that trachyte provides better resilience to thermal shock from repeated heating and cooling than other tempers, and Chuska vessels may thus have been higher-quality cooking pots than other local or imported vessels. (Similar arguments have been made for the superiority of corrugated pots as compared to plainwares.) This is certainly possible, but in light of the numerous other Chuskan imports it’s not really clear to me that functional considerations were primary determinants of Chacoan trade patterns. Maybe the Chacoans just had particularly close social and political ties to Chuskan communities, and that led to closer economic ties. A lot of this depends on the nature of the Chaco system, which of course we don’t know much about. 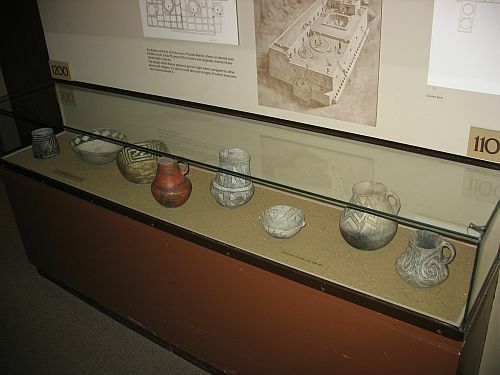 In any case, the large-scale importation of pottery is one of the most striking examples of how Chaco was very much at the center of a regional system. We may not know what that system was, exactly, or how it functioned, but we can see that it existed. The evidence is right there in all those potsherds that litter the ground around the sites in the canyon. Pueblo Bonito is the best-known and most-studied site at Chaco, but there’s still a lot we don’t know about it. 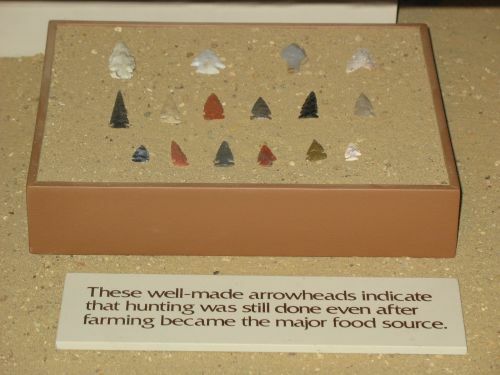 Because it was excavated early in the history of Southwestern archaeology, provenience information for the vast numbers of artifacts found at Bonito is not nearly as precise as would be expected today. 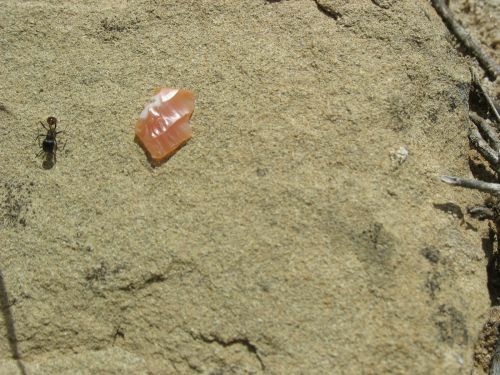 We do generally have information about what was in each excavated room, and often where in the room specific artifacts were, but the careful stratigraphic approaches used today were either totally unknown or in their infancy during the excavation of various parts of Bonito, so interpreting the field notes and site reports can be a challenge. 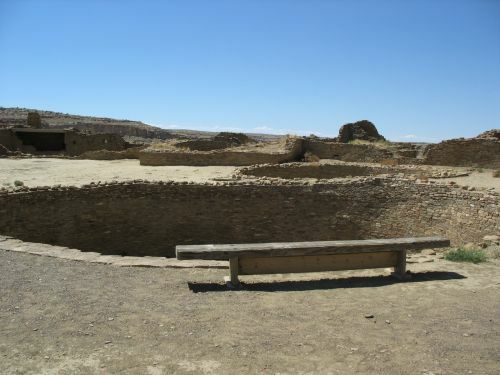 Partly for this reason, a lot of recent interpretations of Chaco have been based mainly on the more recent and better-documented excavations by the Chaco Project in the 1970s. 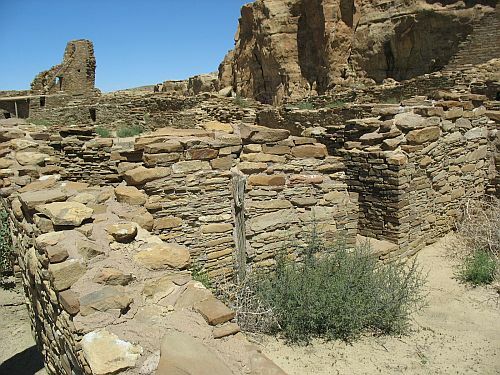 This makes Pueblo Alto in particular, the only great house extensively excavated by the Chaco Project, enormously influential in recent interpretations, not always in beneficial ways. 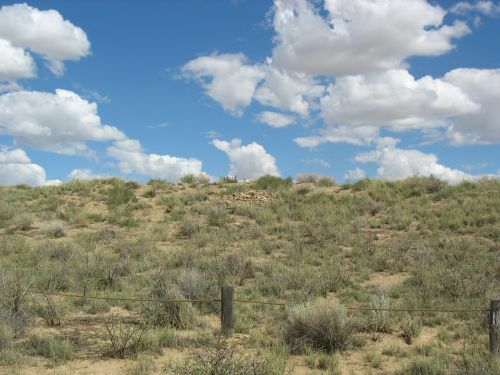 The Pueblo Bonito data has been incorporated into most theories to varying extents, but this often just takes the form of vague gesturing at the elaborate burials and huge quantities of high-value artifacts found there, and sometimes it basically amounts to discounting the importance of Bonito because it is so unlike the other sites. Still, Bonito is important! 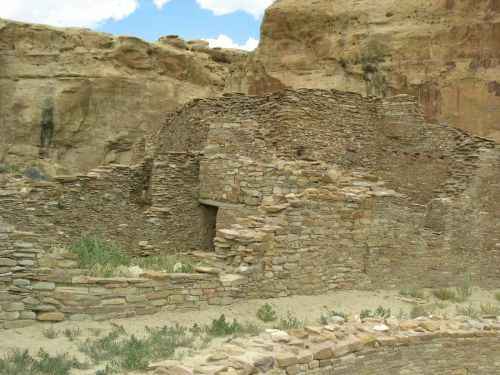 The problematic nature of the documentation notwithstanding, there’s still a ton of data available, and the Chaco Archive has been doing excellent work lately in making it more widely accessible. Their cool interactive map of the site even allows you to click on a room and see a list of all the features, artifacts, tree-ring dates, and pictures associated with that room. I’ve been playing around with it a lot lately, and there’s really a ton of interesting stuff in many of the rooms that we don’t hear so much about. Building on what I was saying earlier about a badger burial at a small site excavated by Earl Morris near Aztec, I decided to look for unusual animal burials or remains that might suggest some patterns in ritual practices or group identities at Bonito. 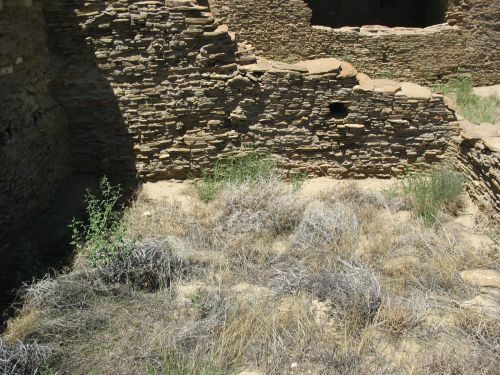 Many modern Pueblo clans are named after specific animals, and it seems reasonable that some Chacoan social groups (which may or may not be equivalent or ancestral to the modern clans) might have had similar identities that would lead them to leave animal remains in certain contexts that could indicate connections through time between different rooms or sites. 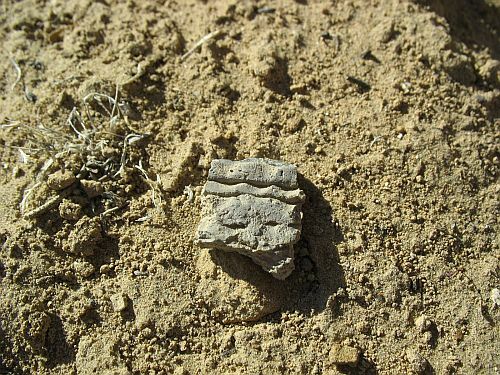 The Chaco Archive database allows you to search for specific types of artifacts, and it even has a special option for non-human burials. The database doesn’t have all the sites included yet, but it does have all of Bonito, and it’s a powerful tool for finding information about the sites that are included. Starting with the non-human burials, the ones at Bonito seem to all be of macaws and parrots. The close connection between Bonito and macaws has long been noted, and Room 38 is particularly known for its large numbers of them, but one thing I hadn’t realized is that, like so much else at Bonito, the distribution of macaws is highly concentrated, not just in a few rooms, but specifically in a few rooms on the east side of the site. The macaw burials, in addition to the two in Room 38, are in Rooms 71, 78, and 306, all of which are in the eastern part of Old Bonito. Not all of these are actually formal burials, but they are all complete skeletons. Extending the search to individual bones adds Rooms 249, 251, 309, and 312, as well as Kiva J and the east mound in front of the site. Again, these are all on the east side of Bonito, although not just in Old Bonito this time. Rooms 309 and 312 aren’t technically in Old Bonito, but they are among the rooms added right in front of it, and are very close to Rooms 306, 71, and 78, which also had macaws. Rooms 249 and 251 are in the block of rooms added onto the southeast part of the site over an earlier extension that apparently built over part of the eastern end of Old Bonito (this part of the site is very complicated and its construction sequence is poorly understood). Kiva J is one of the six blocked-in kivas between this block and the plaza. And, of course, the east mound is the easternmost of the two mounds. What does all this mean? Many have suggested that the number of macaws at Bonito indicates the possible presence of a macaw clan like the one known today at Zuni. If this is indeed the explanation for all the macaws, and it seems plausible given the restricted distribution of them to just a few sites at this time and the contexts in which they are found, it seems that this clan probably lived in or had claims on the eastern part of Pueblo Bonito, and that this association held not just in the earliest stages of the site but even after it was expanded. Perhaps members of this clan were the initial residents of the eastern suites in Old Bonito, then when those rooms were converted to other uses as the site was expanded they moved into the new southeast wing. One question that might be raised at this point is whether this distribution is actually specific to macaws. Maybe all exotic birds and animals are concentrated in this part of the site, which would suggest that there might be something special about the eastern half of the site but not necessarily anything tied to a specific clan. Some research into the layout of the rooms has shown that the southeast corner is unusual in not being divided into obvious room suites, whereas the southwest corner seems to be. Maybe instead of the macaw clan living in the eastern half, everyone lived in the western half and they used the eastern half for macaw-related (and other) ritual. One way to test this would be to look at other unusual animals. Finding animals of ritual importance beyond obvious exotics like macaws is tricky, because many animals were certainly used for mundane purposes and their remains are therefore all over. Dogs and turkeys were kept domestically, so their remains probably wouldn’t indicate anything special about social groupings, and game animals such as rabbits and deer might have interesting implications for access to different kinds of meat but, again, not necessarily specific symbolic implications. That basically leaves animals that don’t serve a clear subsistence or other utilitarian purpose but are nevertheless found in sufficient numbers to suggest something more than mere chance is behind their presence. The best example I’ve found: bears. You basically never hear about bears in discussions of Chaco. 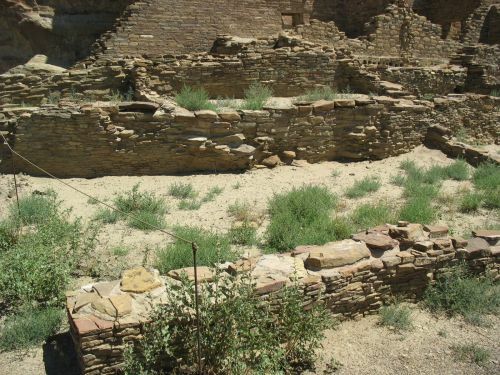 They are not present in the area now and probably weren’t in antiquity either, and their remains are certainly rare at Chaco but not entirely absent. At Pueblo Bonito, bear remains are mostly concentrated on the west side of the site, in stark contrast to the macaw remains on the east side. 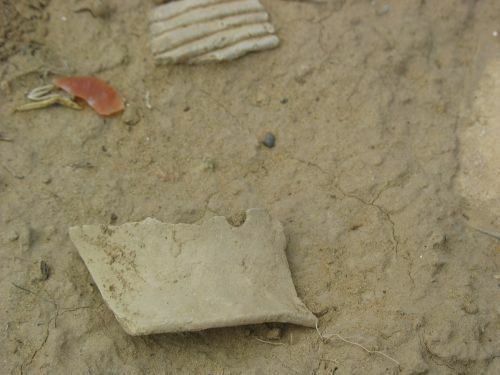 There are some artifacts made of bear bone, including two apparent gaming pieces, one each from Rooms 267 and 290 (both on the east side), but there are also unworked bear bones, especially jaws and feet, particularly concentrated in Rooms 92, 102, and 109, which are part of the same suite of rooms in the west wing of Old Bonito. Room 92 also had a bear hide and mass of hair that is probably also from a bear. Another room in this part of the site, Room 330, had a grizzly bear jaw. Another bear jaw was in Room 66 and a claw was in Room 10; both these rooms are on the east side of the site. So not as clear-cut as the macaw evidence, but still a strong suggestion that people with some sort of connection to bears lived in the western part of the site. 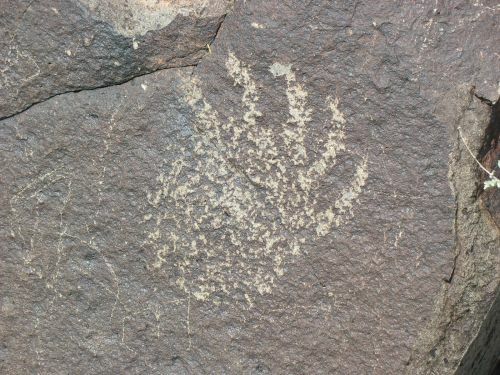 The “bear-paw” motif is well-known in rock art, and George Pepper, who excavated these rooms, reported that Room 97 (the room under Room 92) had similar “bear paws” drawn on the smoke-blackened plaster. Finally, Kiva Q, the great kiva in the west plaza, contained a (dedicatory?) cache of objects that included bear paws. This is all very suggestive, though of course not totally dispositive. 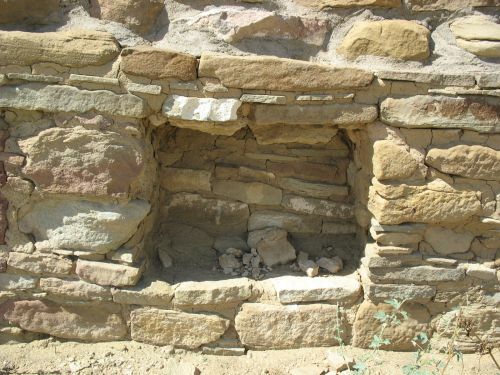 There may be other examples of these sorts of patterns that could give us a better sense of who exactly was living at Pueblo Bonito and what other people at which other sites they had particularly close ties to. Despite the fact that this information has been available for a long time, it’s only now that it’s starting to become widely available in a useful form. New analytical techniques are revolutionizing our understanding of Chaco in all sorts of ways, but one of the most important contributions technology can make is just to make existing information available so it can be assembled, analyzed, and compared to information from elsewhere.